Is the space program a massive waste of money? Well, I mostly think that both the space shuttle and manned spaceflight the space program in general are super cool, but I do not trust my reasons, with what them (the reasons) hinging entirely too much on little-boy “wow” appeal. Meanwhile, when you look at the costs involved your mind really does reel (even putting aside “you could feed X hungry children” lines of argument, which strike me as naive). Said reeling is particularly vivid as pertains to the space shuttle program; it was supposed to be a more-cost effective (reused vehicle = recycling) way to get to space, the costs end up averaging out to $1.3 billion per flight. NASA’s budget over its 50-year history has averaged 1.23% of the federal budget, though it’s been under 1% since the early 1990’s. It’s .55% of the 2009 budget, or about $17.2 billion. In the 1960’s, while the Apollo program was being developed, it spiked to 5.5% of the budget, over $33 billion (these dollar figures are in 2007 dollars). So, what have we gotten for this money, other than the undeniable fun of watching it all slowly, slowly unfold? Well, precious little actually. There are some scientifically useful things, e.g. the Hubble space telescope. And there is the list of advances that came about as by-products of getting stuff into space. Lots of useful stuff on that list, but it all could — and probably would — have been developed (and much cheaper) outside the context of a space program. 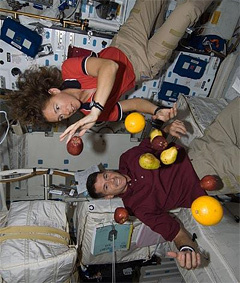 Scientific experiments done in space mostly consist of testing the effects of weightlessness on various things. The results are rarely particularly interesting, and in any case almost completely useless to us here on earth. One day, maybe, we’ll be a space-going civilization. The argument that we should be working towards that holds some water. Yet I wonder if the challenges of going into space wouldn’t be better tackled later, when advances from pure science and other scientific endeavors make them far easier to solve. We weigh the money it would cost to work this stuff out later not just against the money we’re spending now, but against all the missed opportunity cost of what would have otherwise been done with that money. If all we have to show for the difference is the entertainment value of the space program, then it seems difficult to justify rationally. Update: See also The Economic Value of the Space Program. The list of advances is disingenuous at best. It conflates ALL of the advances from various NASA programs with the manned space program. In fact most had nothing to do with the space program and very few had anything to do with the manned space program. As far a pure research goes, the manned space program has also been an almost total bust. Most the research is circular—it’s been how to help humans cope with living in outer space (and the verdict isn’t good.) Outside human factors, I can find no non-political thing the manned space program has done that couldn’t have been done cheaper, faster and safer with robotic missions. I’ll compare your point to something like this: let’s say someone makes a conscious decision to purchase generic brand products as opposed to brand names ones for everything they buy at the supermarket. They’ll save maybe .75 an item on average. So maybe $8 a grocery trip and optimistically $32 a month. $32 a month is about one percent of the average person’s monthly income. Unless the individual in question had a specific purpose set aside for that money (Netflix account, cable, whatever) – there’s a good chance they’ll just incorporate that money into their daily life and not notice themselves any wealthier or better off. $17.2 Billion isn’t enough to fix the larger problems we face, it can’t pay for healthcare, it can’t fix social security or education. It’s considerably less than we gave AIG and auto industry. Add 17.2 Billion to the federal budget and it might help certain under budgeted programs but it’ll eventually just get swallowed and disappear into what we expect our federal budget to be in the first place. We’ll have little to show for it. For 17.2 Billion dollars, we get the real bleeding edge of human achievement. NASA produces thousands of high paying jobs and a great non-defense related career goal for kids who are good at math and science. It’s such an important part of our national identity that no political party wants to be responsible for giving up on it. Don’t consider it practical science, consider it a slowly built monument that reminds us of what we can achieve as a species. If you want to gut the current program and start with one that just aims to produce memorable missions then I’m with you. Other than that, why don’t we focus our budgetary ills on something we actually don’t have anything to show for – like our counterproductive $515.4 Billion Defense budget. For openers, I’d say that logic like “$17.2 billion … might help certain under budgeted programs but it’ll eventually just get swallowed and disappear,” has something to do with how we’re now throwing around hundreds of billions of dollars like it ain’t no thang. But I’ll bet you could talk to any congressman or senator and they’d have at least 10 programs right off the top of their heads that crucially need that $17.2 billion. They might not be “the real bleeding edge of human achievement,” but they’re demonstrably helping real people. E.g., you want to use 17.2 billion to help science in the USA? How about scholarships to top schools for promising but poor kids? After all, what we have is a shortage of scientists, not an overabundance. Or, think about it another way: we have a budding private space program in this country. By releasing all the talent that program’s got locked up, you’d be giving the private side a shot in the arm. Charlie Stross has written on this a few times – his latest post is on the Moon, but in the comments (worth reading) he links some of his older work, which notes the Shuttle was crippled by the military requirements it had to submit to in order to stay funded. We can argue the usefulness of 17.2 billion forever so I’ll just hit on one point you said. I don’t think the problem with private space programs is a lack of talent, it’s a lack of funding. You said it earlier, there’s almost no practical science coming from NASA, so what possible business model could exist that would be worth that much in private funding? Carlos~ True.. I could say that a better model is for the government to set up prizes for accomplishments re. space exploration (ala DARPA/X-prize), but then i’d sound like a privatize-everything republican wingnut. But I don’t know… they have a waiting list of people willing to give them 5 and 6 figure payments for a sub-orbital trip to space! It’s been written to death —by Easterbrook among others— how NASA has been extremely cost-inefficient and how their budget would be much better spent by just handing it over to private industry as grants. Discover magazine a while ago compared the cost per payload pound for all space agencies. NASA was dead last. Remember the goal of the shuttle program was to reduce this cost, yet it costs over $200 million to send an astronaut in the shuttle.